Drawing showing the area around Tonbridge in Kent. The lack of hill sketching on this drawing suggests an intermediate rather than a finished plan. Field boundaries, woodland and buildings are intricately presented. Individual trees are meticulously drawn along the avenue in Knowle Park. Measurements in ink are given in the bottom left of this drawing. A triangulation diagram appears on the reverse of the manuscript. 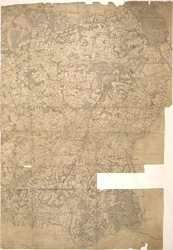 This was used by the draughtsman to plot topographical features.